“Waiting On Wednesday” is a weekly meme that was created by Breaking the Spine. Every Wednesday we highlight a book that we’re really looking forward to. This week my book is : Oathbringer (The Stormlight Archive #3) by Brandon Sanderson. I cannot wait to read this. Cannot. Wait. That’s right – just one word – that’s all you need!! Last night with my pal Jenny (Wondrous Reads) I attended a book event in Watersone’s (Manchester) where Brandon Sanderson was chatting, answering questions, providing readings and giving away upcoming teasers and spoilers. This was brilliant – plus we had chance for a book signing as well. I must say that Brandon Sanderson is one enthusiastic guy about his books. You could be forgiven for thinking there might be a little chink in his armour, maybe he’s forgotten the odd thing – I mean, there are quite a LOT of books and they’re not exactly skimpy on the page count. But, nope, you’d be wrong – he is totally immersed, energetic and keen to talk about them. He could be a really great actor, in which case I would be wrong in thinking that here is a bloke who comes across as really liking his fans. Of course, we are buying his books so I don’t suppose he’s going to sit and sneer at us but he just seemed so genuine. Even after signing huge quantities of books he still chatted with every person who stood in line for the signing, asking each one if they had extra questions, taking time for pictures – even when he was signing sometimes 8 or more books at a time! PATIENCE! I’m not going to make this verbatim as it could just become too wieldy. I apologise upfront if I misrepresent anything here – particularly if I have the future book releases muddled – feel free to correct me. And, be warned that there could be spoilers in the text below so read with caution (I don’t think there are but …). We started off with Mr Sanderson telling how he still felt so surprised to find himself in his current position (with fans no less) when it seemed like only a short while ago he was practically trying to push his books on unsuspecting would be buyers as they entered a book shop where he’d set up a small station selling his books – apparently it took 12 books (13 if you count his high school one) before he actually got published. There were a number of questions. I won’t recreate them here but give a quick synopsis. In terms of writing processes and in particular putting characters through tough times he said that it’s difficult. You become attached to them. When you start it’s a bit like being a director casting a role. You outline your character and write them into a chapter to see how they work out. For that matter Vin from the Mistborn series started her story as a man, morphing into an Artful Dodger type character before winding up as the girl we all now love. Sometimes you like a character but maybe not for the particular book which you’re currently writing – so you put them to one side. And, sometimes you have a genuine ‘ah hah’ moment where your character develops more than you anticipated as you give them the freedom to grow. This of course can help the plot and also prevents the characters from becoming wooden. In terms of the tough times he sometimes puts his characters through – for example Bridge No.4 – well, he thinks of a situation which would maybe involve life and death (being interested in mediaeval siege warfare helps with that) and from there he goes to the emotions that such situations will create in the characters. It’s tough to write such scenes with character’s you have feelings for – but if it makes you as a writer have strong emotion then it will hopefully create strong emotions in your readers alike. As you’ll know if you’ve read any Sanderson, Gods and spirituality usually play a role. In order for the religion in his books to work he has to embrace more than one viewpoint. Otherwise you don’t have the full picture. You have to see using ‘other’s eyes and use 5 or 6 different sets of feelings and thoughts in order to give a rounded feel. In terms of this Sanderson mentioned how one of his favourite books – (which I think was Dragonsbane) helped him to look at his own mum differently or more to the point see events through her viewpoint. He was given the book in high school. It contains a character who makes tough choices when she becomes a mum and eventually chooses to not pursue her fantastic magical abilities. His own mum, an accountant made a similar choice in terms of her career and he said it was when finally reading Dragonsbane that he realised the choices his own mother had faced. Right there – a different viewpoint. In terms of magic systems – Mr Sanderson looks for something that makes him stretch, something that makes him really think – he looks at something and thinks if this happens, or if this changes, if I change one piece of physics how does that impact upon everything else. Sometimes that works and sometimes he just has to start writing and see how things pan out! In terms of future books – he has a plan – to eventually write a book that will link them all together – in that respect, yes, they’re all set in the same universe, sometimes characters are referenced or flit in and out, and there are secrets and easter eggs buried within. Of course that ‘joiny’ up book is a long way off. In the meantime, in order not to face potential readers with an epic 25 book series – he writes other smaller novels such as The Emperor’s Soul (which, coincidentally is bloody awesome!) which give people a flavour of his style and writing. He has a cunning plan people and he’s not afraid to implement it. On top of all this – and there were more Q&A – we had a reading from a short story where the magic system is based on bacteria. A person is infected and in order to keep the person alive to spread the disease the bacteria gives the host magical abilities. On top of this we were also treated to a reading from a potential novella about Jasnah! Exciting stuff to keep us WOR fans going in between books. I must admit that I SO WANTED a reading about Kaladin – I was still very happy though, I think Kaladin and Syl are my favourite characters in the story so far but I do love Jasnah as well! I think I’m right in saying the next Stormlight archive book is due out 2016 with a Mistborn book next Autumn and a Steelheart book maybe Jan 2015. There was more info but I’ve waxed lyrical for long enough so if you want more info check out Mr Sanderson’s blog! 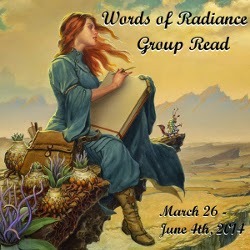 Okay, this is the final week and chapters for Words of Radiance. I confess that I feel sad that it’s all over and even more sad when I think of the insufferable wait we now all have before we find out what’s going on! As in previous weeks, feel free to jump in with any comments if you’ve already read this and, of course, if you haven’t then beware of spoilers below – dishonourable spren are lurking with malicious intent. This week, Sue, over at Coffee Cookies and Chilli Peppers is our lovely host so stop on by and check out the other comments and links. 1. Phew! Kal proves to be the honorable hero that we wanted him to be and decides to save Elhokar. Did you agree with his reasoning? Do you think the king can actually improve, or will Lopen’s mother need to beat him with a spoon? I think there could be potential spoon beatings, however, I think Kaladin did the right thing – you can’t assassinate someone for being useless after all! I think Elhokar needs to grow up a little is all. He clearly wasn’t ready to be king and didn’t want to take over what he thought of as his father’s role. 2. Dalinar has bonded with a very grumpy Stormfather: I have to admit that I did NOT see that coming! Were you more surprised to find that the Stormfather is a spren or that he would agree to bond with Dalinar? That was the biggest surprise for me. I truly didn’t see that coming at all . I suppose now, with the beauty of reflection, there were hints, not least of all in the name. Still, I just didn’t see it. Is Adolin going to be the odd one out then?? I think he could start to feel resentment which would be a shame because I like him and hope he doesn’t turn a bit more evil. 3. 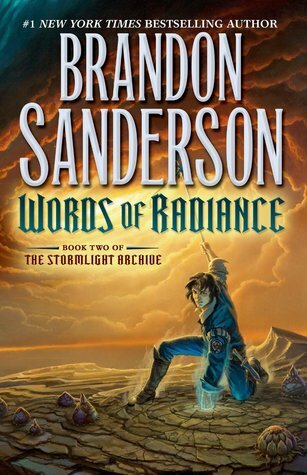 Shallan is now a fully recognized Radiant and has saved pretty much everyone we care about. Then we discover that she killed her mother, but that her father took the blame. Were you surprised by this revelation? Does it make you more sympathetic to her father or not? I actually toyed with thoughts that Shallan had killed her mother. Something didn’t sit right about the way she would stand up for him when her older brother was becoming more aggressive towards him. I can’t say it makes me have any sympathy for her father to be frank. I’m sure he had ulterior motives for taking the blame. He probably wanted to ensure that Shallan would have a good marriage that would assist the family. 4. Eshonai has fallen into a chasm and the Parshendi seem to have been defeated on the Shattered Plains. What do you think of their chances for the future? Will the Parshmen rise as an army of Voidbringers because of the Everstorm? It seems so – I suppose there has to still be some threat as the storms are still raging and it appears that the storm transforms the Parshmen? 5. There were plenty of revelations about plots and plans. Do you have a clearer picture of how it all fits together and who is doing what? Do you think that Moash will survive far into the series? I think Moash still has a part to play somehow. I must confess I was disappointed with him! I need a little bit more time to think about all the plots and plans. Not quite got my head around the ending yet but it will be interesting to read everyone’s thoughts. Perhaps it will help me untwist a few things. Need to go and analyse in a bit more depth. 6. Yay! Syl has returned, and now Kal is a full Radiant. Please discuss the epicness of his transformation and subsequent fight with Szeth. That was the other big surprise. I didn’t realise that the sprite became the blade. It was awesome. The whole scene. I mean, we knew, didn’t we? that Kal would come good and that Syl would not be gone for good but even so, there was air punching! The fight scene with Szeth was Sanderson’s usual unbelievable style and quality and just brilliant to read. All that fighting in the clouds and darting here and there! 7. The strange man in black is revealed to be the Herald of Justice. Any comments upon him, his nasty talking sword and his decision to resurrect Szeth? I’m just going to say – I got a bad feeling about this! Don’t know why. Can’t justify myself and he’s called the Herald of Justice so I’m hoping he’s going to be a force of good. We’ll see. 8. Argh! Jasnah is back from the dead! Discuss, with many exclamation marks!!!! Yep, I danced a jig! Did you read my predictions last week! I knew that she wasn’t out of the story. I was trying to justify in my head why I thought so but all I could come up with was that the scene where she died was too quick – almost brushed over. The other thing I did wonder is if she maybe has talents similar to Shallan – in other words she was able to replicate herself somehow so it wasn’t her body that we saw being murdered? She would still have had to survive the shipwreck, etc, but it could be a possibility? So happy though. 9. Finally, this book ended with lots of questions. Will killing Sadeas alter Adolin? Why is he called THE Lopen? Why are the other Oathgates locked? So many questions that I now seem to have – more than answers for sure! I just don’t know how we’re going to stand the wait!!! And Adolin. I’m gobsmacked. No. Really. I am. Did you see that coming? I don’t like Sadeas but I’m not sure of what to make of that scene. Something felt almost a little bit off about Adolin. I hope he’s not going to become all resentful of the others abilties or jealouse – or worse!